Look at this fine little fella, only about 11-13 cm long and weighing 12 grams. 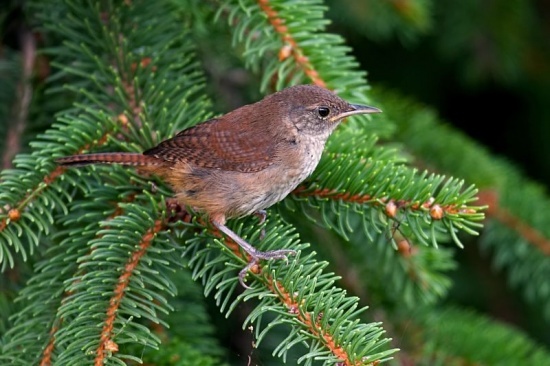 This is the story of Mr. & Mrs. House Wren and the meddling giant (that's me). no damn door bell. I'm painting a picture of middle class lovelyness aren't I? several beetles, and a little nest built by a loving couple of House Wrens. flying around INSIDE the house... these things are tiny but my God they can tweet. away because we don't want to disturb the little fellas (even though they were disturbing me!). out and take a peak!!!! a look... all the while the parents are screaming at me from the bushes just beyond the porch. scream at you!!!! Literally!!!! quite fascinating!!!! out of the freakin' nest, right there in front of me!!! save it's life, and mine for that matter, because by now the parents were really pissed!!!! take her damn Nikon and get lost??? I know... now y'all hate me dontchya? that he wouldn't have far to hop back into it. Then I left them alone... but not for long! little ones to a safer place, on the side of the house, away from nosey giant lady. That's when I took this pic, and his gorgeousness pulled up in the driveway! "wtf are you doing?" he politely asks, "killing baby birds" i reply. consoling me with the news that they'd be snake food anyway!!!! OK... well that's that then, lets have lunch shall we. back at the house I broke the news of the bird disaster.... Syd AKA David Attenborough..
at all... "there are plenty other kids at your school so should I just abandon you?" was my reply. Calmly she told me "no, that's just silly". hear some little tweets from outside the window. So they haven't totally abandoned me!!! what the little fellas allow me to. oh no!! i would have freaked. You are too funny! they were probably ready to fledge anyway. They'll be back!!!!!!!!! That picture is unbelievable! Those little legs are stretched so far. The fact that you still hear chirps is a good sign. You'd better hope the Peta freaks don't find you! We have hummingbirds around here, they are so tiny but incredibly feisty too. They have no problem being around humans.